Based in Danbury, CT, Kitchens by Design can offer you the high quality cabinetry and design services at affordable prices that you expect and deserve. Whether you are in the process of building a new home, or planning renovations to your current one, Kitchens by Design will work closely with you to take your ideas and vision and convert them into a reality. Our showroom located at 88 Mill Plain Road in Danbury, CT, features several displays showing a variety of high quality and affordable cabinetry styles. 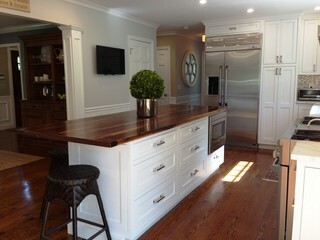 We exhibit a complete selection of American made Dynasty/Omega cabinetry and Cambria counter-tops. Samples of virtually all doors/finishes are available to view in the showroom! Feel free to stop by our showroom at anytime or contact us today at (203) 297-6036 to schedule a free design consultation! Determining which style of cabinets will best suit the layout of your kitchen is part of the design process. Our in-house designer will work closely you to explain all of the options available, while remaining within your predetermined budget. Our kitchen and bath cabinet showroom in Danbury has beautiful displays featuring all of today’s latest styles of kitchens cabinets. Visit our conveniently located showroom at 88 Mill Plain Road and see for yourself or request a free kitchen design appointment. At Kitchens By Design we know that bath space can sometimes be limited, which is why we believe that having the right cabinets can make all the difference. Our line of Dynasty products offers a variety of standard-size bathroom vanities that can be customized to fit the contours your room. Our affordable bathroom cabinetry design services can enhance the beauty and increase the value of your home!